Throughout the course of the season, Colts.com will run a “Newcomer of the Week” following each regular season game. With the Colts having an influx of the newcomers this season here’s a look at the” Newcomer of the Week” from San Francisco. For the second straight week, running back Ahmad Bradshaw takes home the honor and this one comes after a week in which he fell under the radar. New Colts running back Trent Richardson received the headlines late in the week but it was Bradshaw’s “angry” running style that sealed the victory on Sunday. Bradshaw had 19 carries for 95 yards and a touchdown in the 27-7 win. He also added three catches for 16 yards. Following halftime, Bradshaw rushed for 62 yards and it was his three-carry, 42-yard stretch on the fourth quarter, seven-minute touchdown drive that sealed the game. Early in the second quarter, Bradshaw was shaken up following a one-yard rush and it looked as if the Colts would have to rely on Trent Richardson and Donald Brown for the rest of the afternoon. However, the toughness of Bradshaw was evident when he returned later in the quarter and that was needed considering how little of the playbook Richardson had learned since Thursday. The physical nature that Bradshaw brings to the running back position is something his teammates continually rave about and those runs were a major reason why the Colts knocked off the defending NFC Champions on Sunday. “A lot of people didn’t believe we were physical. A lot of people thought we were just finesse,” defensive end Ricky Jean Francois said after the game. –Running back Trent Richardson ran for 35 yards on 13 carries and scored a one-yard touchdown in his first game with the Colts. Richardson’s touchdown on his first ever rushing attempt with the Colts marks the first time a player achieved such a feat since Gordon Brown on 10/4/87. –Wide receiver Darrius Heyward-Bey had five catches for 59 yards on Sunday and his yards after the catch were particularly effective. –Offensive guard Hugh Thornton started his first NFL game on Sunday. Playing left guard, Thornton helped the Colts offense amass 172 rushing yards on 39 carries on Sunday. Take a look below at the top pieces from Thursday, August 29th. It’s not a secret that over the better part of the last decade, the Indianapolis Colts have been known as an offensive juggernaut. Robert Mathis has been apart of all those teams and he’s ready to change that stereotype. “We want to put it out there that we have defense in Indy too. It’s something that we’ve been working hard for and just want to make the most of it,” outside linebacker Robert Mathis said earlier this week. When the final whistle blows tonight on the preseason finale, Chuck Pagano will have no time to rest. Over the next 48 hours, Pagano and his staff will have to tell 22 players that their dream is over, for now. Chappell’s article goes into detail on how Pagano deals with those cuts. “The way we do business around here, we talk about family,” he said. “You build relationships in a short period of time. (Players) understand it. Coaches understand it. For names like Andrew Luck and Reggie Wayne, Thursday night’s preseason finale might not call for many minutes played. However, take a rookie like Hugh Thornton. The rookie saw his first NFL action last week and Chuck Pagano said the third-round pick could get a starting nod this evening. This last exhibition is traditionally for reserves trying to make the team. While much of the work has been done and opinions formed, it’s that final opportunity for guys to make a lasting impression. Thornton doesn’t fit that definition. A healthy body insures he will have a roster spot. But he’s still treating this game against the Bengals like the other guys with everything on the line. After missing the entire 2013 training camp with an ankle injury, rookie Hugh Thornton made his NFL debut on Saturday night. Thornton entered on the Colts third offensive series and would go on to play the entire second and third quarter at right guard (42 snaps). Just a few days before the Colts were scheduled to head to Anderson, Thornton got rolled up on during the rookie camp and he just recently returned to practice. Not only was Thornton effective against the Browns (apart of both Colts touchdown drives), the third-round pick was frequently running down the field picking his teammates off the turf. With starter Mike McGlynn sidelined with a bruise knee, the opportunity is there for some significant reps at the right guard spot. Interior depth along the offensive line has been somewhat of a mystery with Thornton and fourth round pick Khaled Holmes also missing a bulk of training camp. Thornton’s play on Saturday night showed the “mauler” mentality that the Colts saw when drafting the Illinois product. 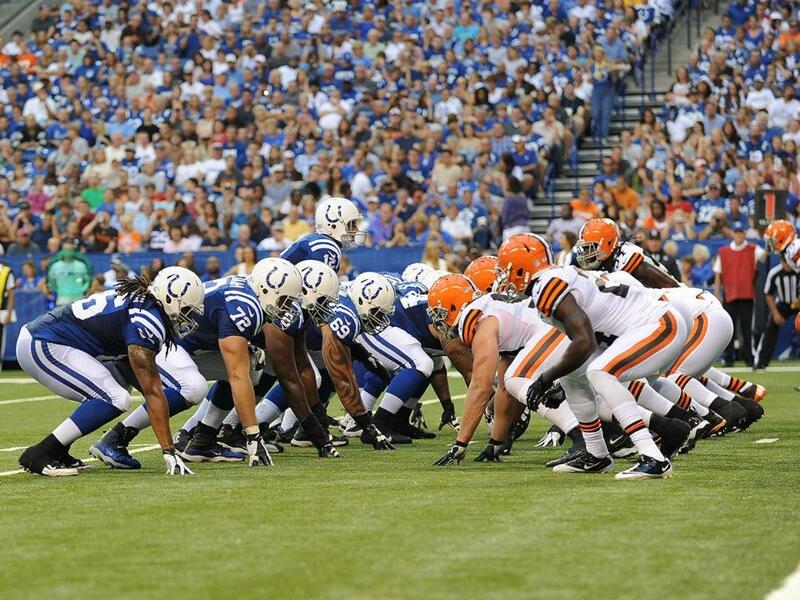 The Colts will conclude their 2013 training camp at Anderson University this Friday. Practices will take place each afternoon through Thursday, before a final Friday morning session wraps up three weeks in Anderson. With a preseason game in the books, here’s a look at five topics to focus on before the Colts travel east this weekend to take on the New York Giants. Andrew Luck looking for scoring drives: It was a short, but solid, afternoon for the Colts first-team offense on Sunday. Luck admitted to a mental error with his cadence at the line of scrimmage that led to a sack. Also, a Coby Fleener fumble ended a potential scoring drive. Against the Bills, Luck was 4-of-6 for 41 yards. Expect the Colts second-year quarterback to get a few more series of action on Sunday night. Putting together sustained drives, ending in points, is a point of emphasis this week. Getting DHB his first catch with the Colts: Darrius Heyward-Bey is still working his way back from a knee sprain. He ran with the first unit against the Bills but did not record a catch. Expect DHB to get some more 11-on-11 work in practice this week as the Colts try to solidify a potent top three receiver group in Reggie Wayne, T.Y. Hilton and DHB. Starting offensive line needs to stay in tact: This goes without saying but given the depth behind the starting five, keeping the current unit healthy is vital. Each member of the starting five has been out there for every practice during training camp which is a welcoming sign with two new starters being brought in. Backup Joe Reitz got multiple quarters at left tackle against the Bills after primarily working at guard in the early part of training camp. If the Colts can get rookies Hugh Thornton and Khaled Holmes back out on the practice field than the offensive line would have some depth as the midway point of the preseason approaches. LB-Justin Hickman could be done for the year: Chuck Pagano said Hickman’s foot injury suffered against the Bills is potentially season ending. Hickman was starting at ILB on Sunday with Pat Angerer, Jerrell Freeman, Mario Harvey and Josh McNary all sidelined with injuries. The competition for a starting spot next to Freeman seems to be between Kavell Conner and Kelvin Sheppard, at least until the names mentioned above return from various injuries. Waiting for the debuts of LaRon Landry and Bjoern Werner: Two of the Colts more intriguing defenders sat out against Buffalo with minor injuries. Having Werner back out on the field this week, as Pagano said he expects, will help a Colts pass rush that recorded just one sack and one quarterback hurry in the preseason opener. At the backend of the defense, the Colts missed five safeties with Landry the headliner of the group. If Landry makes his debut next weekend, he will do it in the stadium that he called home in 2012 with the New York Jets. Also, the Giants are an opponent Landry knows well after five seasons with the Washington Redskins. With Week One in the books in Anderson, here are four offensive items to look towards in Week Two. The Colts will practice the next three days before an off day on Wednesday. Things will pick back up Thursday and Friday, with the preseason opener coming on Aug. 11 against the Buffalo Bills. Pads rev up the hitting-Chuck Pagano was very pleased with what he saw out of his team once the pads were put on last Tuesday. The only full-live tackling the Colts do during training camp comes in goal line drills. Staying healthy has to be atop the most important goals list moving forward, especially when you look around the NFL and see some significant injuries. Andrew Luck’s growth-As the first week moved along, Luck turned in some impressive stretches with his best day coming on Friday morning. Pep Hamilton alluded to the offense not being fully installed yet so we should continue to see that over the next few weeks. While Reggie Wayne and Darrius Heyward-Bey remain the most frequent targets of Luck, the second-year quarterback has done a wonderful job spreading the pigskin around to the other receivers, tight ends, running backs and even a fullback. Depth on Offensive Line-The Colts starting five that came out of minicamp remains intact after Week One. However, after those five you have Hugh Thornton who has been nursing an ankle injury and missed the entire first week. Fellow rookie Khaled Holmes also hurt his ankle last week and has been in a boot ever since. Guard Joe Reitz got a “stinger” on Friday and Pagano said he expects him to miss a few days. None of the injuries appear to be serious and getting a look at Thornton will be a focus the rest of camp. DHB’s consistency-Similar to Luck, DHB had his best days of camp late last week. Wayne marvels at the skill set that DHB brings to the receiver position and has high hopes for the new Colts receiver in 2013. Stacking together consistent practices is key this week for DHB as we are just over a month away from the regular season opener against his former team. Mother Nature held off long enough on Tuesday as the Colts got through their first padded practice of the year. The hitting was revved up during the afternoon practice with the running game being the focal point. Physicality taken to another level: The first of nine padded practices are in the books after Tuesday’s afternoon session. The hitting started early and often with 1-on-1 drills between the running backs and linebackers and then the offensive and defensive lines. Some of the biggest hits on the afternoon came from inside linebacker Kavell Conner and new safety LaRon Landry. It might not have the excitement of a two-minute drill but watching blocking drills can be very telling of who will see playing time on a team that has preached physicality since the start of training camp . Over the next few weeks the competition should separate themselves with the running game continued to be focused on with the padded practices underway. Josh McNary can still ride this bike: The Colts welcomed linebacker Josh McNary fresh off his service in the Army. McNary trotted out to practice early in the afternoon and wasted no time making an impression. He dominated his first two reps in one-on-one drills and showed the pass rushing prowess that led him to set Army’s school record for sacks (28.0). Ryan Grigson told McNary before practice that being back out on the football field “would be like riding a bike” and the 251-pound outside linebacker agreed with that sentiment following his first NFL practice. McNary’s progress will be interesting to watch at one of the Colts deepest positions. Depth on lines critical moving forward: Perhaps no position on the football field has to rely on more bodies during the course of the game than the defensive line. After day one, it’s pretty clear the Colts have a ton of defensive line depth with rookies Montori Hughes and Bjoern Werner (with his hand on the ground) winning a majority of their reps.
Having guys like Josh Chapman, Drake Nevis and Hughes not running with the first team just shows how deep the line can be. On the other side of the ball, the Colts are still waiting to see what they have in picks Hugh Thornton and Khaled Holmes. Thornton is nursing an ankle injury that he suffered late last week. Holmes now joins his fellow rookie on the sideline after the Colts fourth round draft pick left Tuesday’s afternoon practice with a right ankle injury. Joe Reitz seems to be firmly entrenched as the Colts sixth offensive lineman, seeing some time in jumbo packages on Tuesday. The roster for the Colts has been updated to current heights and weights for the 90 players that are scheduled to report to training camp. Here is a link to the updated roster. Below are some of the more significant weight changes on the roster. QB-Andrew Luck (239 pounds)- A gain of 5 pounds. RB-Vick Ballard (224 pounds)- A gain of 7 pounds. WR-Griff Whalen (197 pounds) A gain of 12 pounds. TE-Dwayne Allen (265 pounds) A gain of 10 pounds. TE-Coby Fleener (247 pounds) A loss of 5 pounds. TE-Weslye Saunders (261 pounds) A loss of 9 pounds. OT-Anthony Castonzo (307 pounds) A loss of 8 pounds. C/OG-Khaled Holmes (319 pounds) A gain of 17 pounds. OG-Hugh Thornton (334 pounds) A gain of 14 pounds. NT-Josh Chapman (340 pounds) A gain of 24 pounds. DE-Lawrence Guy (318 pounds) A gain of 18 pounds.